The Office of the Interim Chancellor works to provide leadership for the immediate operational management and governance of UH Hilo within UH System administrative policy. 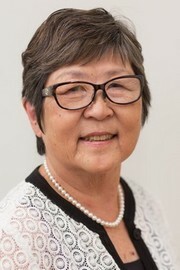 Marcia Sakai was appointed interim chancellor in August 2017. She joined the UH Hilo faculty in 1991 in the field of economics becoming tenured and promoted to the top professor ranks over the years. She was the founding dean of UH Hilo’s College of Business and Economics in 2005, and then was appointed vice chancellor for administrative affairs in 2011. As vice chancellor, she made great progress toward improving campus-wide efficiency in several areas, notably technology infrastructure and sustainability measures with special focus on energy conservation. 1941 Hawaiʻi Vocational School is founded, and after several transformations, becomes Hawaiʻi Community College in 1969. 1947 The Hilo Program begins, and after several major spurts of growth, becomes the four-year Hilo College in 1969. 1969 Hilo College is merged with Hawaiʻi Community College, becoming the University of Hawaiʻi at Hilo. 1991 UH Hilo and Hawaiʻi Community College are separated.